We spent a few days in Rome before the cruise, and after the cruise spent a day in Florence. After having to leave the trail, we decided that since Janet had to rest her foot, what better way to do so than on a cruise ship! 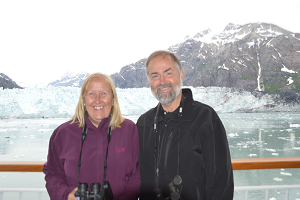 We did back-to-back cruises in Alaska on the beautiful Norwegian Sun. We flew to Vancouver, cruised 7 days to Anchorage, and they stayed on the ship for 7 days back to Vancouver! After a few weeks more of rest, we reattempted our hike on the Pacific Crest Trail, but only got about 33 miles before deciding it was not to be. We both worked off and on for a few months, and then cruised again, this time for 21 days on the Norwegian Sun, in the Caribbean. We dived in St Lucia, St. Thomas, Aruba, Curacao, St Maarten, and went sightseeing in Cartegena, Columbia - our first South American Country! 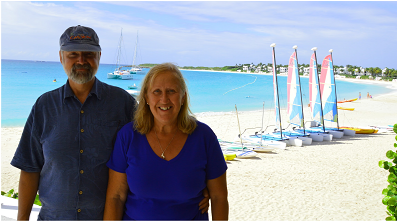 This picture is of us on Anguilla - we took a ferry there from St Maarten on the second cruise. We spent a record (for us) 45 days on cruise ships in 2013!! !